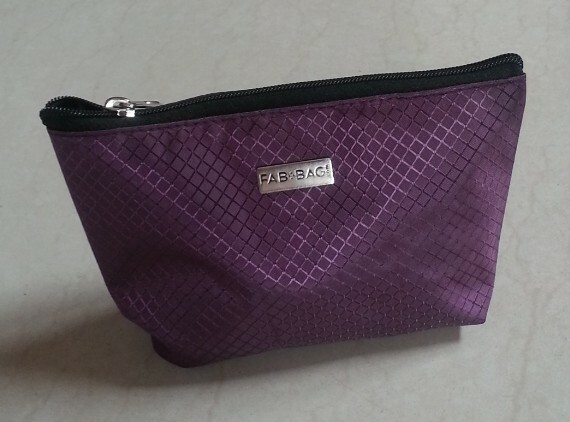 Hey everyone, finally after a long wait I received my July Fab Bag this afternoon. 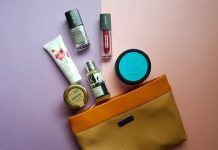 This month they have sent a dark purple pouch with glossy finish and has a silver metallic tag with Fab Bag written on it. 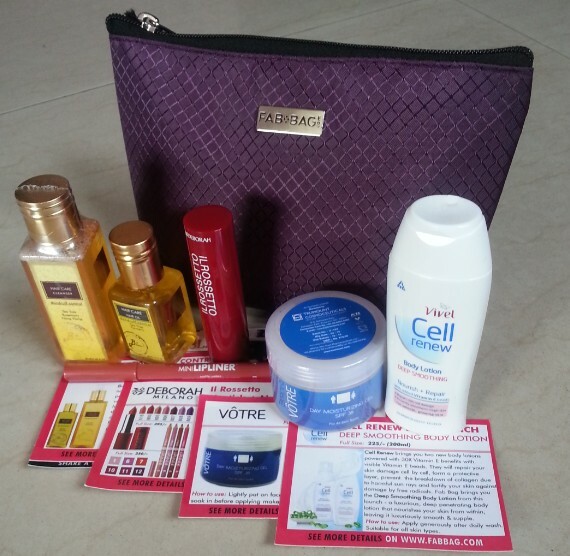 I got 4 products samples from brands – Votre, Bio Bloom, Deborah Milano and Vivel. Products information cards are also provided. 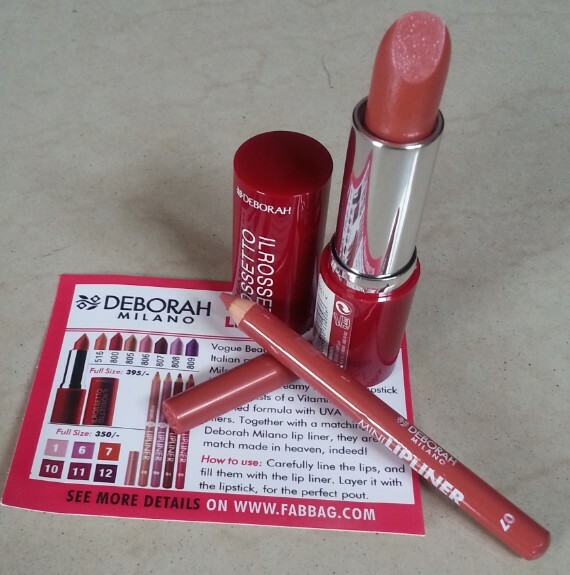 Deborah Milano IL Rossetto Lipstick + Lipliner : I got a full size lipstick in shade 516 with the same color mini lip liner. It is a beautiful light peach shade with silver glaze, an ideal shade for daily wear. It has creamy texture and gives nice color pay off in a single stroke. It is enriched with Vitamin A, C, E and has UVA & UVB filters. 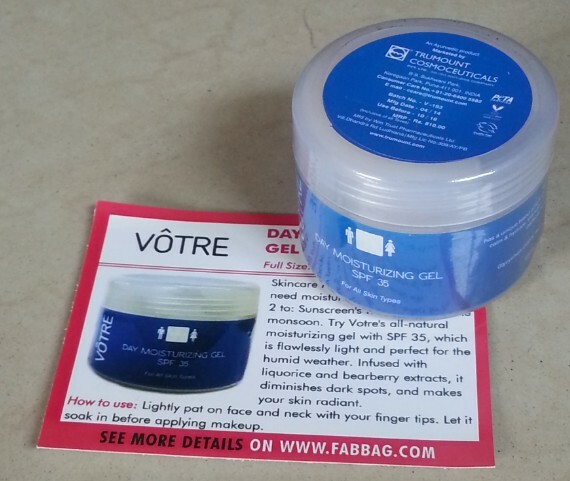 This is my favorite product from this month’s Fab Bag. 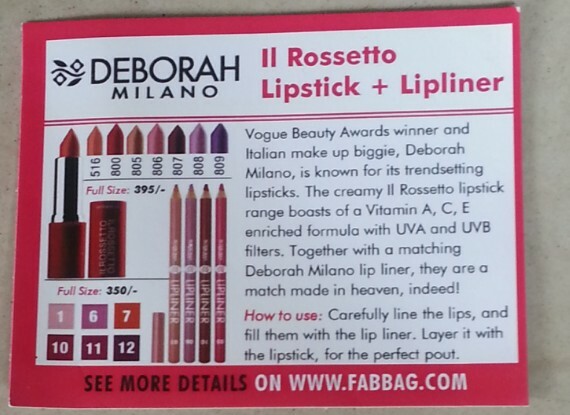 Deborah Milano IL Rossetto Lipstick + Lipliner Price in India is Rs.395. Click to read full review. 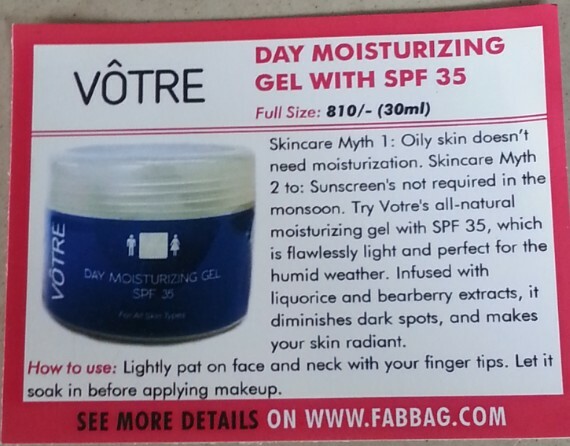 Votre Day Moisturizing Gel with SPF35 : I got full size jar of this gel. I have a combination skin and I’m very excited to use this gel. 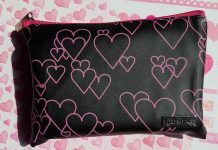 It is enriched with licorice & bearberry extracts and has SPF35. I’ll come with the detailed review after using this gel. 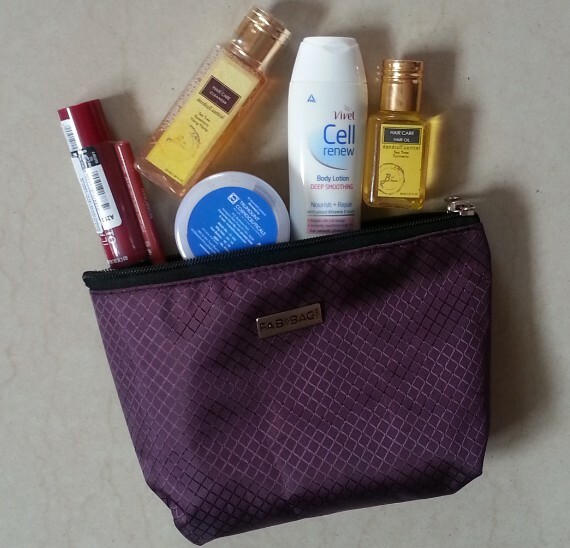 Votre Day Moisturizing Gel with SPF35 Price in India is Rs.810 for 30ml. Click to read full review. 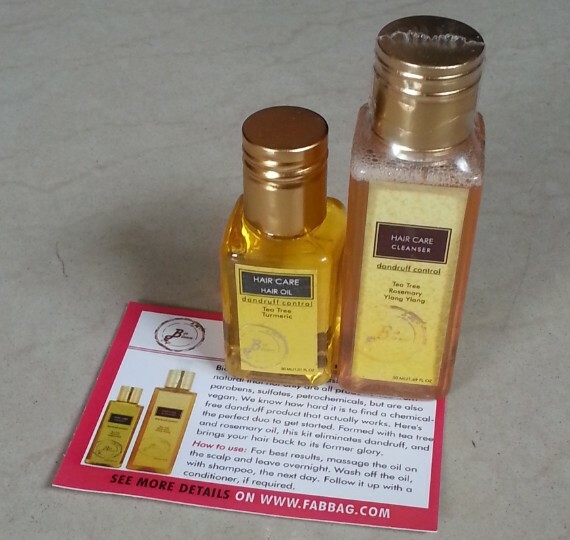 Bio Bloom Dandruff Control Oil & Cleanser Kit : I got 30ml sample of hail oil & 50ml sample of hair cleanser. I love Bio Bloom skin care products and this is my first hair care product from the brand. I’ll definitely use this dandruff control kit and will share my views about it. 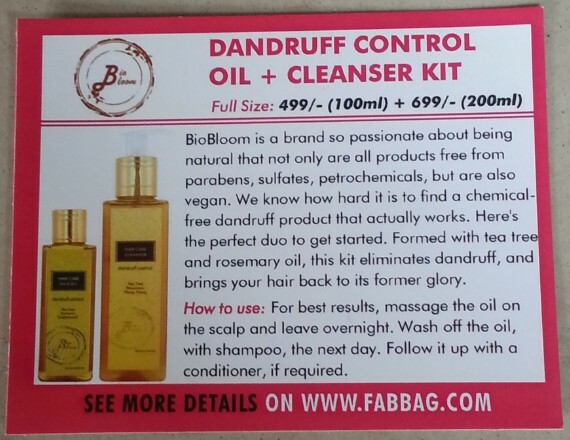 Bio Bloom Dandruff Control Oil & Cleanser Kit Price in India is Rs.400 for 100ml (oil) & Rs.699 for 200ml (cleanser). Click to read full review. 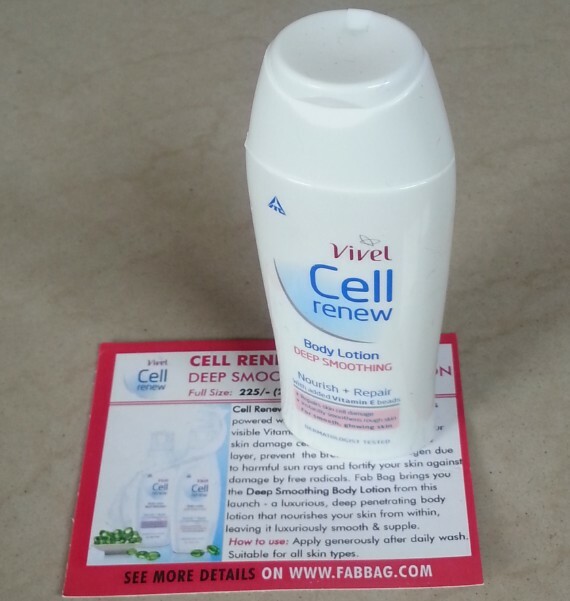 Vivel Cell Renew Body Lotion : Last but not the least I got 50ml sample of this body lotion. It claims to repair skin damage cell by cell, forms a protective layer from harmful sun rays and nourishes skin. 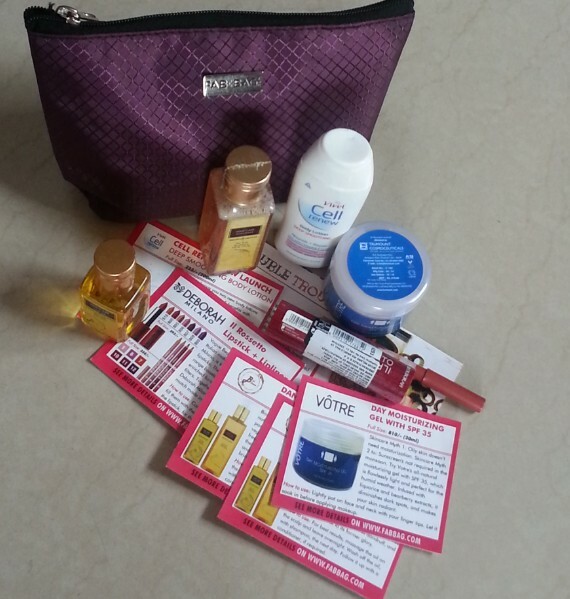 The sample is good enough for 5-6 usages. 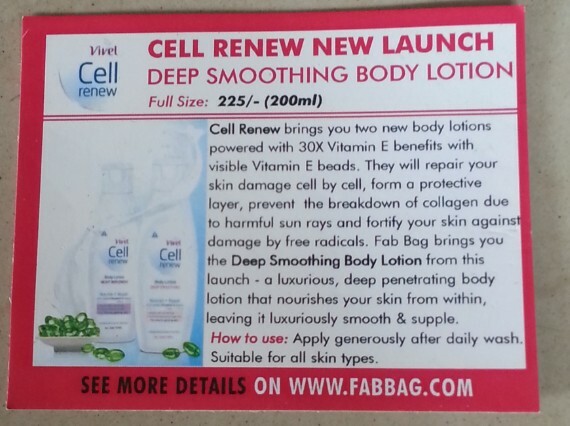 Vivel Cell Renew Body Lotion Price in India is Rs.225 for 200ml. If you have not subscribed yet, click here and get a Bag full of surprises. Yeah, it’s a pretty shade with good pigmentation. The Lippie & the liner look good! :) Enjoy your goodies!! 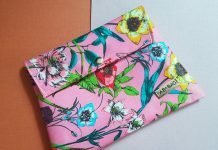 All the products are adorable..
Am Waiting for my Fab Bag !